Fearless Fighters is one of my favorite films. It didn't make the list, but it definitely would have been in the top 20. I discovered this film when it was released on dvd by Image Entertainment. I watched the film and told my brother that we needed to watch it. Then my mother, who was sick for almost seven years, died. I spent that week at my Father's, trying to get everything ready for the wake and funeral. At night, right before bed, me and my brother would watch a film. 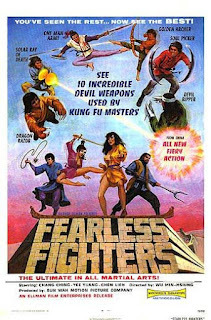 Fearless Fighters was one of those films. We had such a blast watching the film that, for a brief time, the problems that we were facing went away. Please watch this trailer and then go find a copy of the film. You will not regret it.